I should have known that it was only a matter of time before we had an Instagram linky party from Michelle as she posts Five for Friday using only hashtags. That girl is obsessed and I love it! 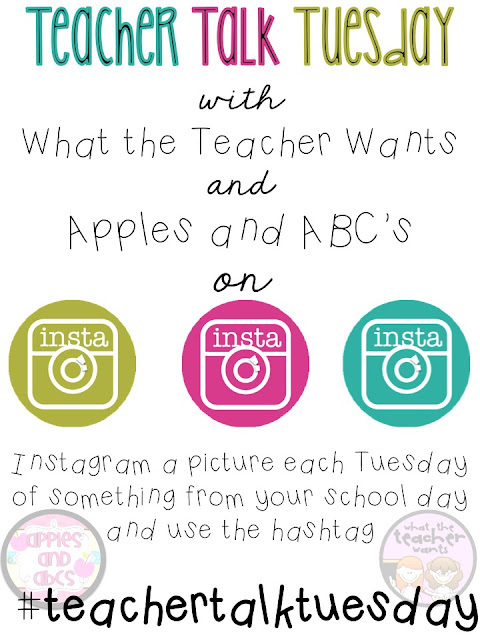 Apples and ABC's and What the Teacher Wants are teaming up to host a fabulous weekly linky party on Instagram! All you have to do is post a picture on Instagram each Tuesday from your school day with #teachertalktuesday. Easy as that! I was wondering where I was getting all these new Instagram followers from but now I am sure it is from these two. Instagram is hopping with teachers right now! Are you on Instagram? If not you are seriously missing out! I was clueless about it at first but now I love it! You get daily snapshots into the lives of teachers that don't always get posted on their blogs. But my favorite part is that even if you don't have a blog, you can easily link up for this party if you just have a phone! As you can tell it's a random hodge podge of stuff: nails, school stuff, desserts, and much more! You can click the little instagram button on the right hand side of my blog to find me. Leave me your instagram name in the comments below so we can find each other. See you on Tuesday when the takeover begins!